THE SKINNY: As we all know, I have a slight* lipstick addiction. The only problem with red lipstick on a Casper-esque skintone is that when it feathers, everybody can see it. Who wants to look like a crazy old cat lady with lipstick bleeding outside the lip line? Not me. Well, at least not for another 20 years. Until then, I had to find the Miracle Bra version of lip primers, something that you can’t openly see, but would keep my lipstick high and perky—right where it’s supposed to be. 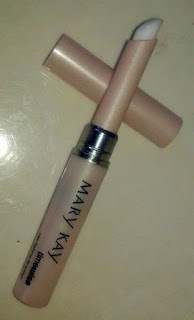 Enter Mary Kay Timewise Age Fighting Lip Primer. I got suckered into a “facial” by a MK saleslady a few years back (by “facial,” they really mean they will let you try out their products, get you hooked and then you’ll be selling blood plasma to pay for the subsequent addiction issues). When she waved the little wand under my nose and promised that it would keep my lipstick from migrating and help erase lip lines in the process, I had to try it (and several other items as my free facial turned into $150 worth of product. Yikes!). I cannot praise this little while tube enough. It is not a lip conditioner or moisturizer, but rather provides a strong base upon which to build your lipstick art. It goes on smoothly and dries quickly. It locks onto your lipstick like Paula Deen locks onto a stick of butter — it doesn’t let go. The life of the lipstick is greatly extended (I’ll be honest, I’m lazy and can’t be bothered to reapply often). As for the minimization of fine lines, I’m not sure, but hey, it can’t hurt. It’s worth buying this only for the lipstick grabbing ability. KEEP OR TOSS: Seriously? Gotta keep this winner! If you are a lipstick addict, you have to add it to your bag. And keep the crazy cat lady at bay. CHECK IT OUT: Check out the complete Mary Kay TimeWise line and a cool new interactive catalog!